Some Bayshore homes back on one of five ponds. This special village is limited to 339 half-acre and larger residential lots on a 314 acre peninsula. All lots back on the lake, on green space, on the golf course, or on internal ponds. At present, about 300 lots have been developed with individually designed homes. Re-sales are always available and vacant lots are fully serviced with municipal sewer and water. The village enjoys complete township services, while telephone and hydro utilities are underground on most streets, making views from the road much more attractive. IMPORTANT: The Bayshore Village Association is a private, members only association. Not all owners of lots or homes in Bayshore Village are members of the association. 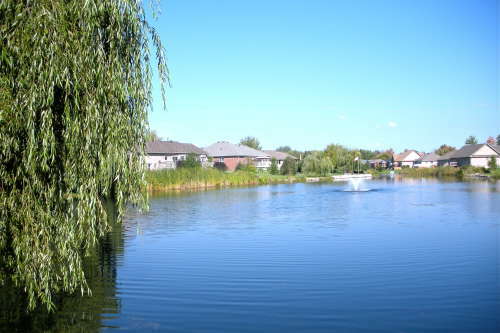 If you are considering the purchase of a lot or existing home in Bayshore Village, please visit the Association's office at the Hayloft Community Center or call the office at 705-484-0754, to ensure that the owner of the lot or home you are considering is a "member in good standing" of the association.